There was a time when I was so annoyed with their tvc always airing their testimony about the product and I was like, oh cmon, it's too good to be true since Marian Rivera started it all. But then in search for the perfect remedy on my acne-prone face (after using facial mask, I got this tremendous acne and pimple dark spots on my face), I started reading about the bloggers testimony as well. There was one user which made me laugh so hard (sorry but I really can't think that it will happen on her upon using it, she got tons of big zits!) and was actually the reason why I even try it for myself. Of course I know for a fact that every product does not guarantee same result on every user. You should really try it for yourself. Although I must admit I am still in doubt of using Maxipeel products because of the "burning" issues on their faces. One thing I like about Maxipeel is that it is readily available locally and in leading supermarkets, even on drugstores. Plus, it is way cheaper and a complete set of regimen compare to other beauty essentials. That was what I do, but if you're going to ask the Maxipeel Facebook Page, they will advise you to use the exfoliant cream in the morning. But since I am just staying at home, I opt for exfoliating at night. They also advise me to stop using the facial scrub too since it's too harsh on my face, instead, use the facial wash twice or even thrice a day. After using the Moisturizer for 3 days, I stop using it because it makes my skin looks oily and I don't want to be burden by pimples again. 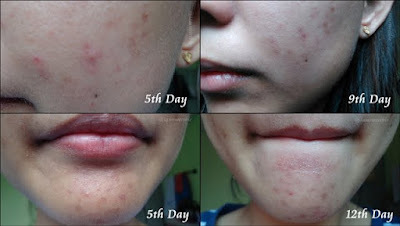 It is indeed normal if you have pimple breakout at 1st to 2nd week of using their products. It is a sign that the skin is exfoliating and removing the dead skin cells, purging out every excess dirt on your face. What I notice is that after a week of using it, it lightens my face. I also got super small pimple, one or two and not having large ones. I was giddy excited on what will happen when my period comes. Normally, I have two large zits waiting to pop on my chine whenever my period is approaching. To my dismay, it happen but it didn't last long. Usually, large zits on my chin will lasts up to 6 days but now, it only lasted for three days. I also use the Pimple Eraser to lessen the dark spots. Every week, I take pictures on my progress and to see if it's really working on me. Reality hits me that it is really helpful and amazing! 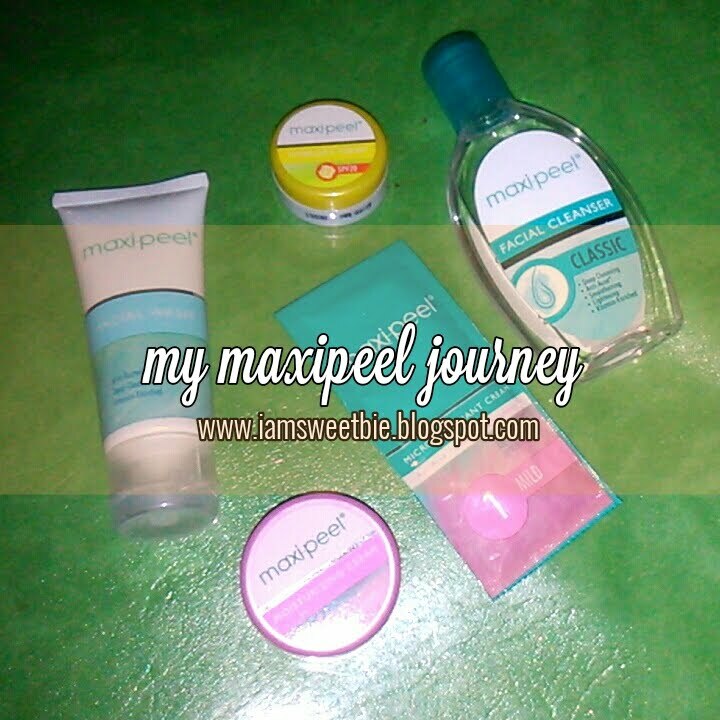 These are my Maxipeel Journey photos to prove the effects of the product on my face. I was advice to used their products for a two months period to see the results and since I am using the Exfoliating cream I don't need the resting period (if you're using the exfoliant solution, you need to stop after two months and have 1 month resting period before using it again) and just continue the routine until I am satisfied with the result. After trying out different facial wash and toner, finally, the long search is over. Have you spotted the difference it makes on my face after using Maxipeel products? Disclaimer: This is not a sponsored post. I buy my own products and tested them on my own in order to gather this information. What works for me may or may not work for you. Pictures posted are mine unless otherwise stated. Wow what an amazing transformation! I've always been hesitant to use MaxiPeel because I've been hearing that i causes too much redness and irritation. Thanks for providing this review! Hi Ochi, sorry for the late reply. Too much redness is caused by the Maxipeel solution exposed to direct sunlight without applying the sun protection. I only use the Cream one since I also do not want that to happen to my face. Right now I am trying their Zero solution. How do you fine zero solution? Got a sample of it, but haven't tried it yet. Hope to hear some feedback from you. I'm using it for more than a month. Kaso hindi continous yung paggamit ko unlike the cream before. There are days that I skip using it and just wash my face with MaxiPeel Facial Wash. Napansin ko na kahit hindi ko madalas gamitin e mas mabilis yung effect niya compare sa cream. Kapag nagamit ko na siya ng 2 months continously I'll post a review. Medyo mapimples ako for the last two months kasi I am taking pills din kaya di ko pa makita ng ayos yung results niya. Wow! I wish I could get the same effect of Maxi-Peel on my face too. I have used the product before for 1 month. I experienced peeling on my skin. However, I have discontinued using the product. The next time I used it, 1 month after that time, I reuse the product but the thing is I am not peeling anymore. I have used the product 2 weeks already but the peeling is not present. Do you have an idea why this happened? If so, why? Thank you! Yung peeling, yun yung sign na getting better na yung skin mo. Nagpapalit balat na kasi siya kaya ganun. Wala akong ganung effect, kahit anong gamitin kong whitening products. Are you using cream or the solution? If you are using cream you have to use the product continously but it really take 2 months to see better results just like what I do. If you are experiencing itchiness or redness, that is the time you have to discontinue using the product. Hi~ how was your experience?